Quarterly survey says 27.1% of the labour force is out of work. A year ago it was 26.7%. By Aidan Jones for GROUNDUP. The latest Quarterly Labour Force Survey (QLFS) released by Statistics South Africa on Tuesday says the unemployment rate for the fourth quarter of 2018 was 27.1%. This is up from 26.7% at the same time in 2017. 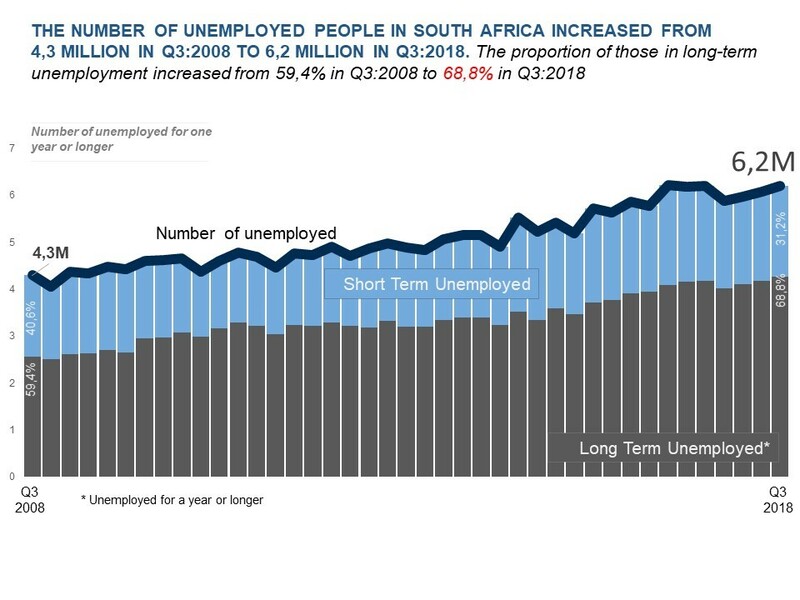 Over a quarter of the able working population in South Africa does not work, making this a country with one of the highest unemployment rates in the world. If you include people who are able to work but not looking for work (expanded unemployment rate), the rate jumps to 37%, up from 36.3% in 2017. Also of concern is that 38.9% of youth aged 15-34 are unemployed while not being in education or training for employment. This is up from 38.4%. 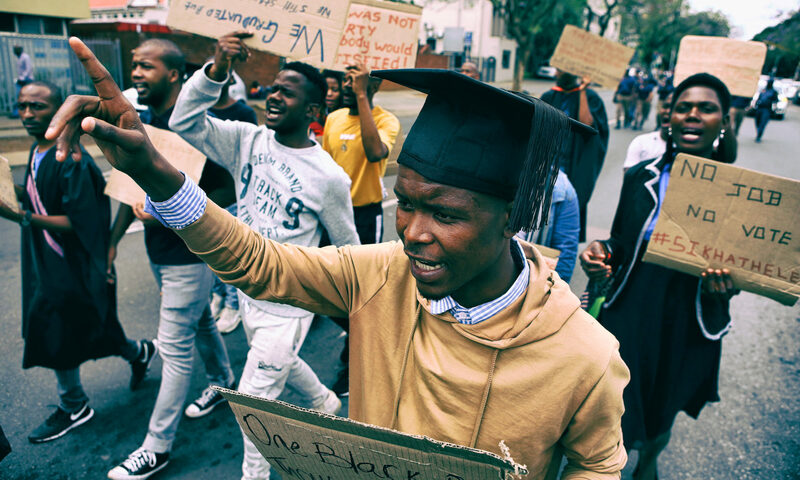 One in three economically active South Africans between the ages of 25 and 34 — a key cross-section of the labour force — is unemployed. By race, the unemployment rate is highest among black people (30.4%) and lowest among white people (7.6%). The number of people seeking work for a year or longer (long-term unemployed) has been consistently high over the past decade. 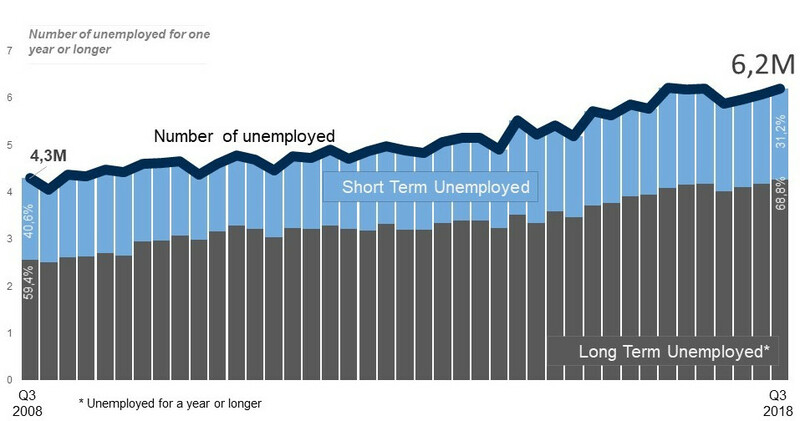 More than two-thirds (4.4 million) of unemployed people had been unemployed “long-term” in the fourth quarter of 2018.